Canada has 19 active players in the NCAA men's basketball tournament and, while that's not a national record, this mega-talented group should leave a Canadian mark on March Madness like never before. They're record-breakers. They're big-game players. They're award winners. And they come from coast to coast. "A few years ago, you'd have Canadians playing, right? Now you've got Canadians not only playing, but making an impact," said broadcaster Leo Rautins. "And it's not just from Toronto. You've got kids from all over the country. Now you've got a kid from Nova Scotia (Lindell Wigginton of Iowa State), a kid from Calgary [Clayton Henry of New Mexico State], a kid from Vancouver [Brandon Clarke of Gonzaga]." 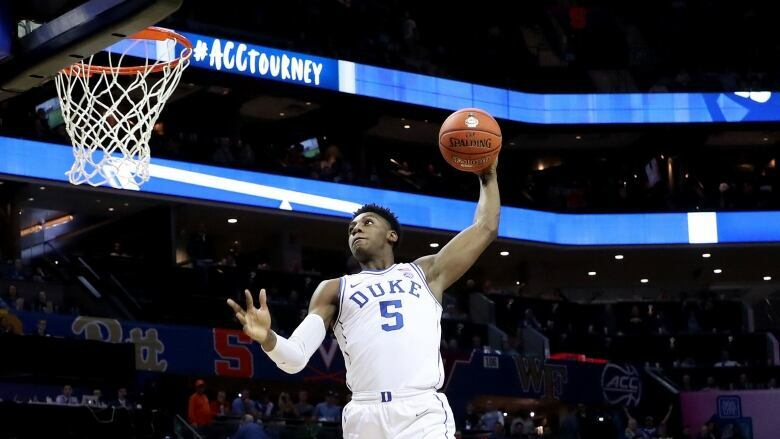 Teen star R.J. Barrett, a consensus top-two pick in the upcoming NBA draft, tops the list after helping Duke to its first No. 1 overall seed in the tournament since 2015. Barrett became the fourth player in Duke history to record a triple-double, and broke both the ACC scoring record and Duke scoring record for a freshman. "R.J., what scouts love about him is his compete level. He's got a great motor. If it's a big game, if there's a big matchup, you know if it's important and you've got to step up, he's one of those guys that does," said Rautins, former coach of Canada's men's team. "I've heard that from everyone who talks about him." Duke, which won it all the last time they had the No. 1 overall seed, opens the tournament on Friday where they'll play the winner of the First Four game between North Carolina Central and North Dakota State. But the list of Canadians who step up when the lights are brightest doesn't end at Barrett. The past few thrilling days of wild finishes have been proof of that. Andrew Nembhard, a 19-year-old point guard from Aurora, Ont., hit a buzzer-beating three-pointer to lift Florida past LSU in the Southeastern Conference Tournament quarterfinals. Moments after the tournament teams were announced on Selection Sunday, Nembhard posted a photo on Instagram of himself being doused by a dozen water bottles in the post-game locker room. Underneath he wrote: "Let's go dancing!" A pair of Canadians led Iowa State to the Big 12 title. Wigginton had 17 points and Ottawa's Marial Shayok scored 15 as the Cyclones beat third-ranked Kansas. "They had a tremendous season," Rautins said. "These guys won the Big 12 tournament, and so they're a team I think is going to be interesting to watch. Wigginton is quick, he attacks the basket, he's really good in clutch situations, plays with a lot of energy. Shayok, same thing, just another kid who's really explosive and plays hard. He's an intense player." Rautins calls Clarke, a 22-year-old forward at Gonzaga, one of the most "underrated stars" of the season. "I'd call him a star," Rautins said. "He was a big player with Gonzaga this year, but he's still kind of under the radar. But this kid can jump out of the gym, he blocks shots, he changes games with his ability, so he's one of the more underrated players that I don't think enough people are talking about in this tournament." Gonzaga earned a No. 1 seed in the tournament for the third time in seven years, despite having its 21-game win streak end in the West Coast Conference tournament title game in a loss to Saint Mary's. "We've had pressure the whole season on us," Clarke said. "It's something we're all used to by now. We're going to take it like it's any other game, but we have to make sure we're all focused and we're all ready." No. 2 seed Michigan is led by Canadian big man Ignas Brazdeikis, who won Big Ten freshman of the year honours. "What's interesting about him is you haven't heard his name as far as draft picks, right?" Rautins said. "He's had a good year, Michigan's had a really good year, and if that team goes deep into the tournament, I wouldn't be surprised if you'd see his name on the draft boards all of a sudden. Because he's going to be an NBA player. The question is when." Michigan opens Thursday against Montana in the West. The Wolverines beat Montana last year on the way to the national championship game. East Regional: R.J. Barrett, Mississauga, Ont. (Duke); Nickeil Alexander-Walker, Toronto and Jonathan Kabongo, Toronto (Virginia Tech); Eze Dike, Montreal (Yale); Ja'Shon Henry, Wilcox, Sask. (Bradley). West Regional: Brandon Clarke, Vancouver (Gonzaga); Oshae Brissett, Toronto (Syracuse); Devonte Bandoo, Brampton, Ont. (Baylor); Joseph Chartouny, Montreal, (Marquette); Mfiondu Kabengele, Burlington, Ont. (Florida State); Stef Smith, Toronto, (Vermont); Dominic Johnson, Windsor, Ont. (Buffalo); Luguentz Dort, Montreal (Arizona State); Andrew Nembhard, Aurora, Ont. (Florida); Ignas Brazdeikis, Oakville, Ont. (Michigan). Midwest Regional: Clayton Henry, Calgary, (New Mexico State); Marial Shayok, Ottawa and Lindell Wigginton, Dartmouth, N.S. (Iowa State). South Regional: Kyle Alexander, Milton, Ont., (Tennessee).